Author(s): Charles Awortwe, Division of Clinical Pharmacology, Stellenbosch University, Cape Town, South Africa., south africa	Vamshi K. Manda, Cristina Avonto, Shabana I. Khan, Ikhlas A. Khan, Larry A. Walker, Patrick J. Bouic, Bernd Rosenkranz. Kalanchoe crenata popularly known as “dog’s liver” is used in most African countries for the treatment of chronic diseases such as diabetes, asthma and HIV/AIDS related infections. The evaluation of K. crenata for herb-drug interactions has not been reported. This study therefore aims to evaluate the risk of K. crenata for herb-drug interaction in vitro. Crude methanol and fractions of K. crenata were incubated and preincubated with recombinant human CYP2C19 and CYP3A4. Comparative studies were conducted in both human liver microsomes and recombinant human CYP to ascertain the inhibition profile of the crude extract and the various fractions. The cocktail approach of recombinant human CYPs was conducted to confirm the inhibition potential of the fractions in the presence of other CYPs. The results showed significant time-dependent inhibition of tested samples on CYP3A4 with crude methanol (39KC), fractions 45A, 45B and 45D given IC50 fold decrease of 3.29, 2.26, 1.91 and 1.49, respective. Time dependent kinetic assessment of 39KC and 45D showed KI and kinact values for 39KC as 1.77µg/mL and 0.091 min-1 while that of 45D were 6.45 µg/mL and 0.024 min-1, respectively. Determination of kinact based on IC50 calculations yielded 0.015 and 0.04 min-1 for 39KC and 45D, respectively. Cocktail approach exhibited fold decreases in IC50 for all test fractions on CYP3A4 within the ranges of 2.10 – 4.10. At least one phytoconstituent in the crude methanol extract of Kalanchoe crenata is a reversible and time-dependent inhibitor of CYP3A4. 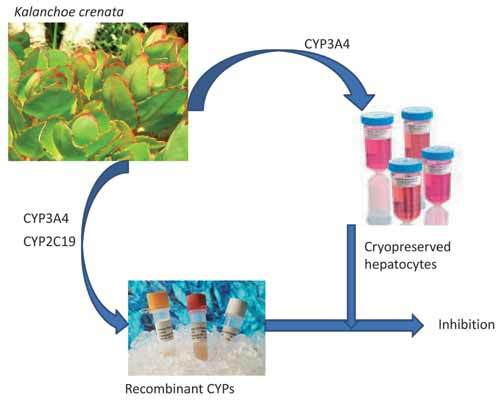 Keywords: Human liver microsomes, Kalanchoe crenata, recombinant human CYPs, reversible inhibition, time-dependent inhibition. Affiliation:Division of Clinical Pharmacology, Stellenbosch University, Cape Town, South Africa. Keywords:Human liver microsomes, Kalanchoe crenata, recombinant human CYPs, reversible inhibition, time-dependent inhibition. Abstract:Kalanchoe crenata popularly known as “dog’s liver” is used in most African countries for the treatment of chronic diseases such as diabetes, asthma and HIV/AIDS related infections. The evaluation of K. crenata for herb-drug interactions has not been reported. This study therefore aims to evaluate the risk of K. crenata for herb-drug interaction in vitro. Crude methanol and fractions of K. crenata were incubated and preincubated with recombinant human CYP2C19 and CYP3A4. Comparative studies were conducted in both human liver microsomes and recombinant human CYP to ascertain the inhibition profile of the crude extract and the various fractions. The cocktail approach of recombinant human CYPs was conducted to confirm the inhibition potential of the fractions in the presence of other CYPs. The results showed significant time-dependent inhibition of tested samples on CYP3A4 with crude methanol (39KC), fractions 45A, 45B and 45D given IC50 fold decrease of 3.29, 2.26, 1.91 and 1.49, respective. Time dependent kinetic assessment of 39KC and 45D showed KI and kinact values for 39KC as 1.77µg/mL and 0.091 min-1 while that of 45D were 6.45 µg/mL and 0.024 min-1, respectively. Determination of kinact based on IC50 calculations yielded 0.015 and 0.04 min-1 for 39KC and 45D, respectively. Cocktail approach exhibited fold decreases in IC50 for all test fractions on CYP3A4 within the ranges of 2.10 – 4.10. At least one phytoconstituent in the crude methanol extract of Kalanchoe crenata is a reversible and time-dependent inhibitor of CYP3A4.